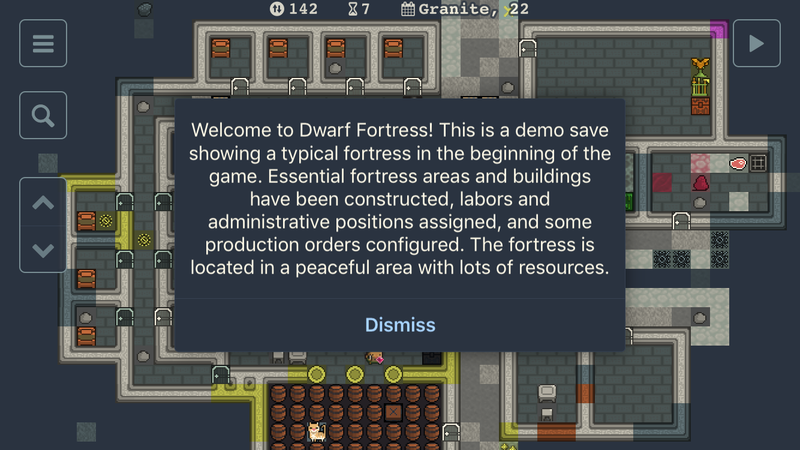 We've just released a major app and server update, and added support for Dwarf Fortress 0.44.12. Subscription users will be updated to 0.44.12 over the next couple days. I hope everything goes smoothly for them and for everyone else. If you have any issues, please let me know. The new world map/missions screen added in 0.44.12 is not available in the app yet, it will be added in one of the usual app updates soon. Just a reminder - if you enjoy playing Dwarf Fortress, whether via DF Remote or on desktop, consider supporting its authors, Tarn and Zach Adams. Dwarf Fortress is free and redistributable, and they rely solely on donations for all these years. This is the same 3D viewer I made long time ago and it's still not quite finished, but it's good enough to look at your fortress in 3D and share it with friends. 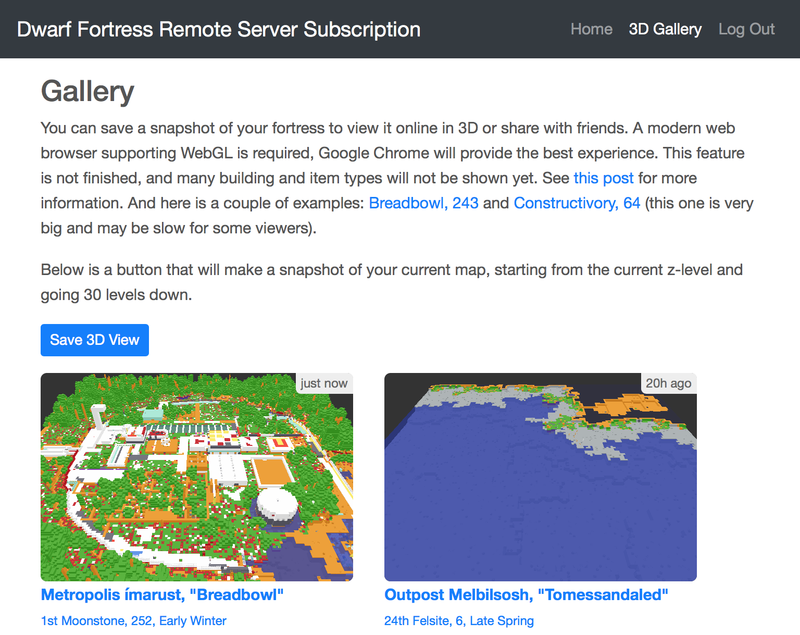 The original viewer is still available for everyone, but now Server Subscription users have a gallery page with all their map snapshots, and also a button in the iOS app to save a snapshot. Links to view individual maps are public and thus can be shared with anyone. The gallery has actually been available for some time now, so for those who already knew about it, the latest changes are the addition of previews and Delete button. Server Subscription has now been available for several days already, I've fixed some glitches, thanks to the brave first users, so it's time for a proper announcement. 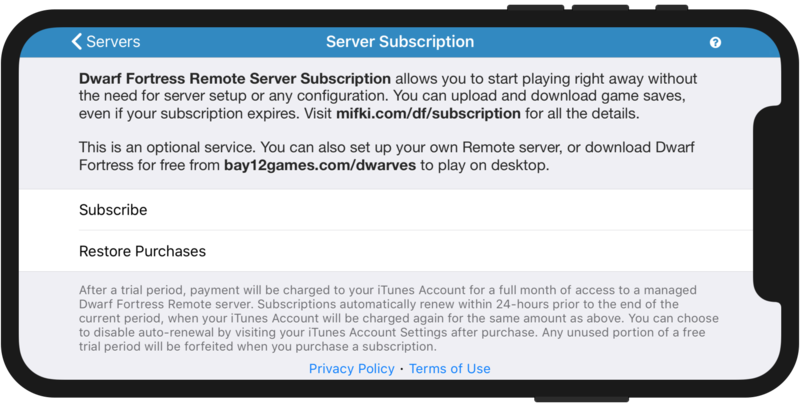 Server Subscription provides, well, a cloud server with Dwarf Fortress + DF Remote running on it. The price currently is 4.99 USD or a corresponding amount in other regions. A free 3-day trial is available. No need to configure and maintain your own server, just download the app and start playing. Also it will help who were not able to set up a server at home due to their home and mobile network configurations. You can upload and download game saves, even if your subscription expires. 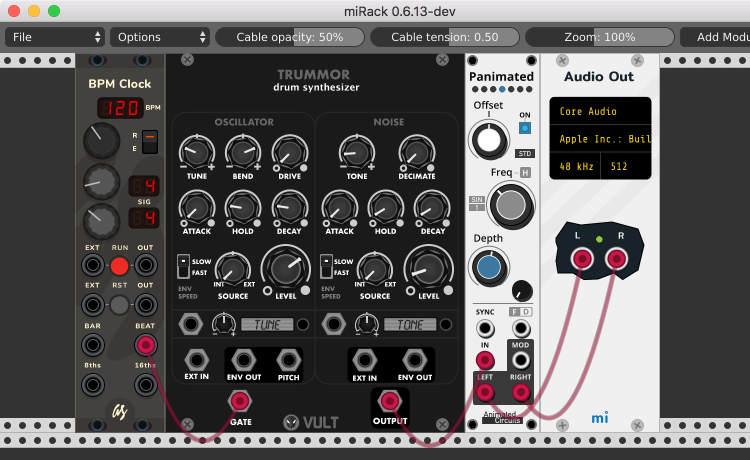 So it's easy to generate world, embark and start playing on desktop, continue on the go, and again on desktop when you're back home. Additional online services. The first one to come will be an online 3D map viewer. The same as I've already mentioned which is available for everyone, but subcribers will have a gallery in their online account, a button to make a snapshot of their current game, and also a button in the app for that. Then, in no particular order: A plugin/command/tool to synchronise local games with online account. A way to play in the browser (like my old Web Fortress and not a custom UI like in the app). And some sort of a successive multiplayer support. And last but not least, subscription users get updated and bug fixes faster because it's easier to investigate any issues I notice. 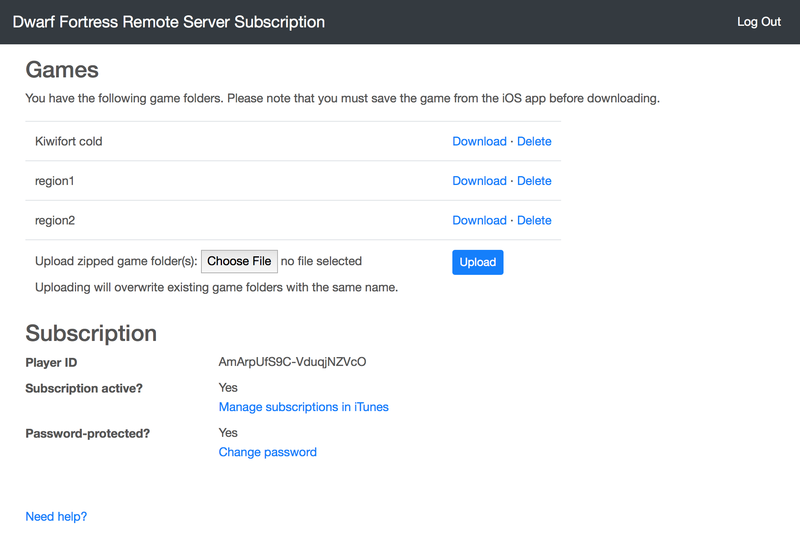 Subscription is an optional service that provides a pre-configured server with DF Remote. Remote server plugin will always be free for installation on your own computer. Dwarf Fortress is a game by Bay12Games available for download free of charge. Support them!